Efraín González is one of Panama´s premier mejoranera players. A mejorana is a musical instrument carved from one single block of wood. It is shaped like a small guitar, with five horse hair or gut strings. Efraín also excels at playing the violin. De Puy & Asociados is proud to support and sponsor talented musicians like Efraín. Enjoy hearing him play in these two elegant selections. De Puy & Asociados hosted a wonderful reception for its esteemed clients at the elegant Arias-Feraud Mansion, located at the historic Old Quarter. They sampled Panamanian food and drinks, while enjoying a folkloric presentation of polleras, violin and guitars. A bottle of fine Centuria Rum was raffled at the end of the party, while every guest took home a Seco bottle. See some of the pictures below. We are pleased to announce that Mr. Miguel De Puy has been named Panama´s National Delegate for ASIPI (Interamerican Association of Intellectual Property) for the period 2015-2018. Interesting article that appeared in Martes Financiero, a weekly magazine published by La Prensa. In Spanish. This past Sunday December 1st we kicked in our Christmas season building dog houses for children in need, together with our families. Have a great holiday season! An excellent article on counterfeit medicines that published in Martes Financiero on November 19, 2013. This very interesting article that appeared on La Prensa´s Sunday feature magazine on May 19, 2013 addresses web content and its connections to IP law. Note that the PDF´s are in Spanish. The Panamanian IP Court informed that it has investigated and processed at least 1100 judicial cases of trademark infringement between 2012 and April 2013,; 90% of these have culminated in a conviction. This announcement was made in the midst of celebrations accompanying IP day, that included the graduation of 15 officers as specialized forensic IP officers. Miguel De Puy, senior partner of De Puy & Asociados, was one of the attorneys that trained and prepared the aforementioned public officers. We are pleased to announce that Ms. Nadia Jorge and Mr. Ricardo Branca have joined our team at De Puy & Asociados. They bring depth and experience to our International Commerce and Immigration portafolios, respectively. To learn more about them, consult the OUR TEAM tab at your right side. Mr. Miguel De Puy trained ANA (Autoridad de Aduanas) officers from Colón and Panamá City to spot counterfeit products on several trademarks, such as Blackberry, Canon, Longchamp, Burberry, Levis, Dockers, Abercrombie, Hollister, Lego, Habanos and others. This training took place on January 29 and 30, 2013. Finally! 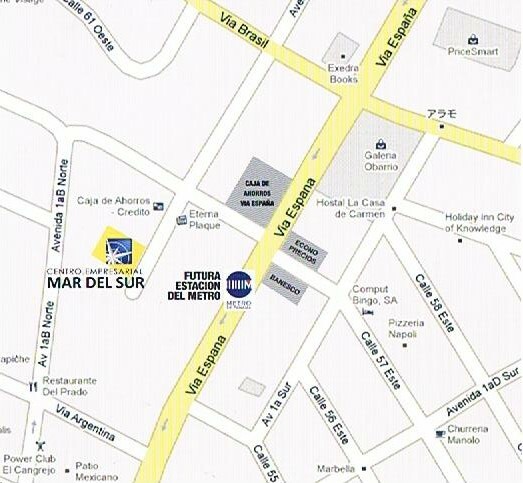 We are pleased to announce our move to new corporate headquarters at Centro Empresarial Mar del Sur, Suite 412. We encourage our clients and friends to visit. Next step: waiting for completion of Line 1 of Panamá´s new Metro system. Our office is located just one block from Vía Argentina Station. The National Customs Authority (ANA) in Panamá has declared that in 2012 it seized 104.4 million U.S. dollars worth of counterfeit merchandize, a 126% increase from 2011. Read the complete article here, in Spanish. Local authorities have determined that the most used routes for these conterfeited products are: China-Panamá-México; China-Panamá-Nicaragua; China-Panamá-Chile y China-Panamá-Honduras. We are soon slated to move to our new corporate headquarters at the 4th floor of Centro Empresarial Mar del Sur, just one block from the Vía Argentina metro stop. 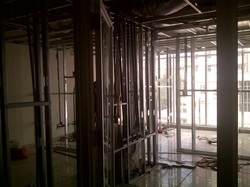 We are currently supervising the interior renovation of our offices. We will keep friends and clients posted on coming developments! Learn more about this important legal matter in this article published by Martes Financiero, La Prensa (in Spanish). Next year, the world of domain names will get bigger. In addition to 22 existing generic top-level domains, hundreds of new .somethings will be available. This short article explains how to deal with this situation. Mr. Miguel De Puy will be in attendance at the midyear International Trademark Association (INTA) meeting, to be held in Orlando, Florida on November 6-10. He will also be attending ASIPI (Asociación Panamericana de Propiedad Industrial) from December 2-5 at Punta del Este, Uruguay. As of September 7th, 2012, Panamá has joined the Patent Cooperation Treaty. 1. Panamá now has a multiclass system. 2. Powers of attorney don´t need to be legalized. Also, a certificate of existence/incumbency is not required. 3. Elimination of international use for domestic use. This means that every trademark application must be filed in our jurisdiction in order to be protected from infringers. 4. A slight increase in government fees. We will shortly communicate these to our clients. 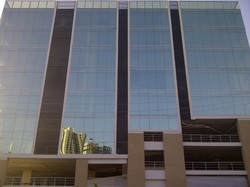 De Puy & Asociados will be located on the 4th floor. De Puy & Asociados will soon inaugurate new corporate offices at Centro Empresarial Mar del Sur, conveniently located at just one block from the soon-to-be-completed metro station of Caja de Ahorros/Vìa España. The offices are also very close to some of the main government buildings. We are very excited about the incoming move; we will keep our clients posted on further developments. The video and pictures that follow were taken on June 8th, 2012. They show the destruction of counterfeit goods by De Puy & Asociados, with the lawful supervision of the Criminal Court and the District Attorney´s IP Office..